This is the time of year when budding artists around the country are busy putting the finishing touches to their final degree showpieces, the fruits of their past few years of artistic labour. Starting today, Slade School of Fine Art in London and Falmouth University in Cornwall are among the art colleges running the first of about 100 graduation shows in coming months, presenting the latest “hot” art produced by students. The annual BA and MA shows are a great place to pick up a piece of original artwork that you can enjoy looking at, but which could also turn out to be a savvy financial investment. You are also supporting promising young artists for whom it is incredibly important to make their first sale as they leave college and step out into the real world. It has never been easier to buy art. Over the past two decades a host of online sites selling contemporary art have sprung up – from small, online-only galleries to big auction houses such as Sotheby’s and Christie’s. An original piece can be snapped up for as little as £45, says Jane Eccles, who works as a programme manager for a utilities company and has amassed a personal collection of 59 pieces over the past three years. “I work long hours and commute, and it’s really nice to get home and to be surrounded by beautiful works of art,” she says. “I enjoy researching artists, and it’s nice to support emerging artists.” Her taste has evolved over time, and she now buys pieces “that challenge me”. She stresses that she buys for pleasure rather than monetary gain and has not sold any of them – although some of the work has gone up significantly in value. Those by painter Peter Kettle, recently voted in as a fellow for the Royal Society of Arts, has nearly tripled in value in the past four years. The piece Brecon Beacons 1 which Eccles bought in 2015 for £450 is now worth £1,200. Another artist she has bought from is the Polish Bartosz Beda, who has been short-listed for several prizes and was selected for the 2012 Catlin Art Guide as the most promising emerging artist in the UK. His work ranges from painting to installation and animation. Paintings that sold for £500 in 2011 are now valued at around £3,500. Eccles also likes Orlanda Broom, whose smaller, lush paintings were priced at £200-£300 at her Winchester degree show in 1997 and are now worth about £7,800. Other favourites are London artist Julia Blackshaw who exclusively “portrays the female form”, and Slade postgraduate Lindsay Mapes who has done a series of paintings on transparent silk and has been selected as one of 12 artists worldwide for a US documentary called Looking for Picasso. Sarah Ryan, a former art teacher who set up New Blood Art in 2004 to represent emerging artists in the UK, advises buyers to look for “some sort of coherence, some kind of unique voice or recognisable style”. She adds that artists who produce “work that’s a bit jarring or uncomfortable to look at are those that go on to be something special”. Ryan will spend the summer on the road, scouting for new talent at degree shows from Aberdeen to Aberystwyth, and has carved out a niche selling graduate art, with prices ranging anywhere from £175 up to £10,000. Delivery fees are capped at 5% of the value of the work which can be bought through interest-free loans, and returned within the first 14 days – although this doesn’t happen very often, she says. 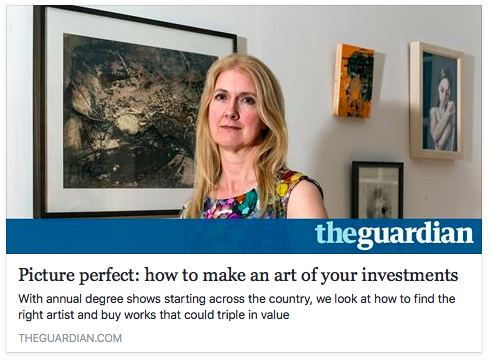 But it has become a fiercely competitive market – the advent of bigger online galleries such as Saatchi Art in 2011-12 meant that Ryan had to scale back her venture, which at one stage employed two people, to once again be a one-woman business. When visiting a degree show Ryan recommends talking to art tutors (make an appointment in advance) and suggests having a coffee with the artists themselves to try and gauge their long-term commitment. The best work sells quickly, so turn up early. Charles Saatchi, the advertising magnate and art collector, sometimes arrives at shows before all the artwork is installed and rival dealers get there (he is famed for buying up entire graduation shows). Investment experts say modern art is an effective hedge against inflation – returns tend to be better at times when prices in the economy are rising, which is the case now. When selling, anything under £6,000 is exempt from capital gains tax and further tax relief applies up to £15,000. But unlike shares, bonds or property it does not produce an income and is not a very liquid asset – you need to be prepared to hold it for several years and may not be able to sell when you want. Art investments are also unregulated, so you can’t fall back on the Financial Services Compensation Scheme if something goes wrong. Bear in mind too that there could be insurance and storage costs. Sarah Ryan of New Blood Art tips two artists who are graduating from their MAs this year. Michaela Hollyfield from Aberystwyth University and Myka Baum from the Royal College of Art. Hollyfield paints ambiguous, semi-abstract landscapes rich in colour, and her pieces are priced at around £275-plus. Other artists to watch are Nicola Wiltshire and Steven Burden. Wiltshire, whose paintings sell for around £175-£750, makes her own paint using contemporary materials such as ground aluminium, and paints on fabric. Burden, who went to Goldsmiths, University of London, and Bath Spa University and has won the Black Swan Arts Open Prize, grew up on the Pepys Estate in Deptford, south London, and says his paintings are informed by the “out-of-scale fortresses” of the “urban jungle”. They sell for between £800 and £6,000.